NOTE: => above means there's a pop out menu. If you're using IE6 then you may experience difficulties with these. Also if you have your security set high then they will not work so click here instead. 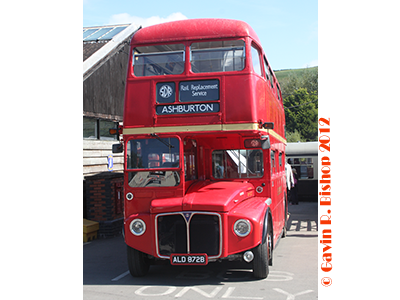 The London Group of the South Devon Railway Association raised an appeal in 2004 to buy one of London's last iconic red Routemaster double deck 'buses for use by the South Devon Railway on its Vintage 'bus service and successfully purchased RM1872, one of the "Ensign 32", in December 2004. These pages are a record of the work and experience gained from owning and operating a former London Transport Routemaster ‘bus. Steps have been taken to establish a new company, South Devon Railway Road Services Ltd, to take over running the 'bus service directly. Please visit the SDRRS website for full details. We trust you find our notes of some use and that you come to the South Devon Railway for a ride or consider hiring the vehicle. Note: *SHEW is a valid alternative to the more common spelling SHOW. It is used here because it's the version used by the former Great Western Railway in their publications and our stated objectives are to promote the standards which best reflect the traditions of the Great Western Railway.